My favorite food in the entire world is pasta. Any kind of pasta. Seafood alfredo, spaghetti and meat sauce, ravioli, the list goes on. Pre-paleo I would make myself sick on pasta. repeatedly. So you can imagine that when I cut out grains, I was pretty freakin sad about my pasta. Spaghetti squash is good and everything, but it will never compare. Zucchini noodles, same deal. Then one miraculous day, I found Paleo Cupboard. And do you know what I found there? Paleo. Pasta. I pretty much died. 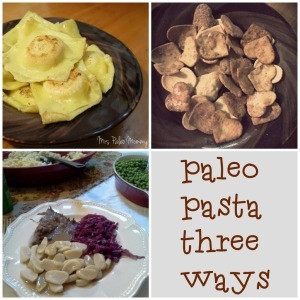 How have I gone like a year into paleo not knowing there was such a thing as paleo pasta?! So immediately I got to cookin. The first thing I made was spaghetti and meat sauce. And I was in heaven. To go a whole year with no pasta is torture. The next thing I made was lasagna. OMG. Are you drooling yet? So the other day i got to playing around with it a little bit. I was thinking about this restaurant my family used to go to called Italian Oven. They served a basket of fried noodles as an appetizer. I know. So I wondered if I could recreate this. I made up a batch of paleo pasta and fried away. The end result was not anything like the fried pasta I remembered. BUT it was an awesome accident. I made paleo crackers! Another food I miss terribly. I hate hate hate it when my family gets together with all of their delicious dips and I cant have any unless if I sit there dipping carrots in while they all enjoy their tasty chips. Well not. any. more. 🙂 I also love to take them with me to mexican restaurants so that I may fully enjoy the mexican experience and dip away into the queso and salsa. Next. My mother was making her famous sauerbraten for when our German Grandfather came to visit. 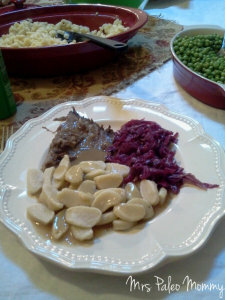 Personally, my favotire part of sauerbraten is the spaetzle served along side, covered in gravy. I could absolutely not miss out on this. But I knew my tummy would have been so mad at me. So once again paleo pasta came to the rescue. Most recently, I had a longing for perogies. 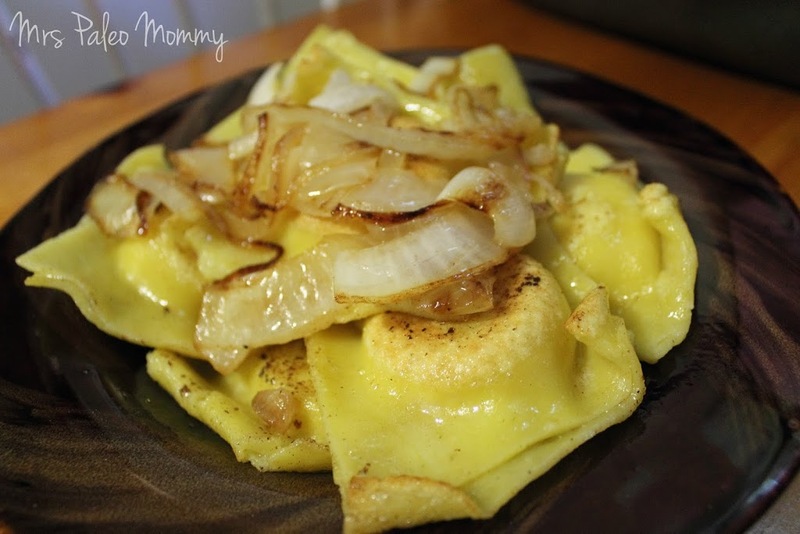 Perogies used to be my ultimate comfort food. Cheesy mashed potatoes cuddled all warm and cozy inside a pasta shell. mmmm. The paleo pasta worked out perfectly. I like to serve mine smothered in caramelized onions. I do see many other possibilities here and I cant wait to try them. I try not to overdo it with this one, because it is starchy. I limit myself to once a week. My next attempts will most likely be some sort of egg roll, ravioli, potstickers, and chicken and dumplings. Of course I will share. So here are the instructions for you. Start each one with a batch of Paleo Cupboard’s Paleo Pasta. -Roll the dough out nice and thin. Just thick enough so that it doesnt fall apart when you pick it up. -Cut out with cookie cutters. 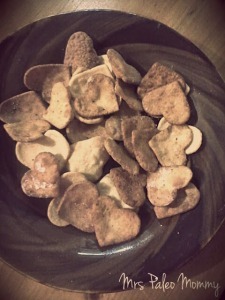 I loved the hearts because the edges kind of curled up, creating a nice dip in the middle. perfect for scooping. -Slice it up, and boil accordingly. -Follow instructions for fauxtato filling. -Bring a large pot of water to a boil, and add a TBSP of oil. 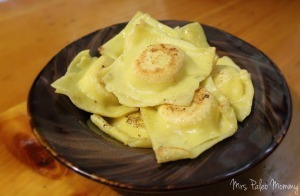 -Roll pasta out and cut into squares about 3×3 inches. 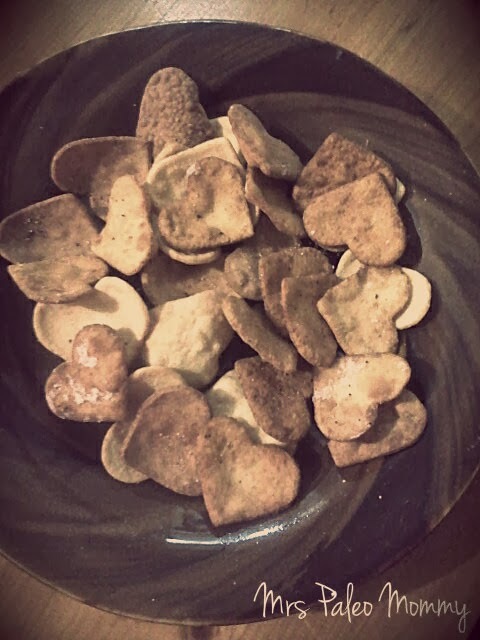 -Place a spoonfull of fauxtatoes on the center of half of your squares. -One at a time, brush the remaining squares with your choice of milk*, and place on top of the filled squares, pressing down the edges. -Boil about 3 at a time, for about 3 minutes each. I like to serve mine up with caramelized onions, so when mine are done boiling, i toss them around in the buttery pan that I cooked my onions in. If you are okay with dairy, top with sour cream. Fauxtato filling: There are two options here. Cauliflower, or parsnips. My favorite potato substitute is parsnips. I love to roast them with a little bit of salt and pepper and some ginger. So good. I also love to mash them. -1 head of cauliflower, OR 1 bag of parsnips (about 5) peeled. -Bring a lg pot of water to a boil. -cook your parsnips or cauliflower until tender. -add the cooked vegetable to a food processor and process until smooth. -add remaining ingredients and pulse until combined.